Max Janofsky and his late wife Danielle. On February 24, Danielle Janofsky gave birth to a son who weighed in at just one pound and 11 ounces. Jake was delivered via c-section and placed in the Neonatal Intensive Care Unit at the University of Pennsylvania. 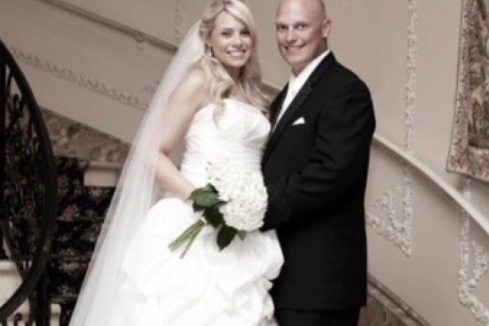 Three days later, Danielle, 30, succumbed to melanoma that had spread to her liver, kidney, stomach and brain. She had been diagnosed when she was six months pregnant and decided to fight so that her son would have a chance to live and her daughter, 4-year-old Avery, would get to have a little brother. In the month since Danielle's death, more than $60,000 in donations have been made to support Deptford Township K9 officer Max Janofsky, a retired Army Staff Sergeant and combat wounded veteran who served multiple tours in Iraq and Afghanistan. The funds are intended to benefit trust funds for Avery and Jake, who remains on a ventilator at Penn. Danielle had previously diagnosed with melanoma after the removal of a mole in 2015. She had been receiving regular check-ups and was expected to recover before her cancer returned and metastasized. In an interview with NJ.com, Janofsky explained that he hopes his wife's death will raise awareness of the dangers of melanoma. "If there's one thing I want people to really take away from this it's that melanoma isn't a little thing, it's serious," Max said. "Sometimes you have two years, sometimes you have two months, other times you have days. Take it seriously and get checked."